An executive order to implement bulk cannabis exports from Denmark went into force Jan. 1, according to the Ministry of Health, putting Danish medical marijuana companies on a solid footing to compete across the European Union. Denmark is now a clear front-runner in Europe, where countries and businesses are jostling for position for what United Kingdom-based analytics firm Prohibition Partners estimates will soon be a multibillion-dollar industry. Within the space of one year, medical cannabis was brought into the legal fold, comprehensive regulations were introduced and medical marijuana exports were allowed. Germany has tried and failed to kick start a domestic cultivation program. Israel still doesn’t allow exports – although it finally passed a law. Italy still has only one producer – the military. Read the full Danish executive order here. A medical cannabis export law approved in mid-2018 allowed for single-dosage MMJ exports, but the new executive order effectively expands that to include bulk shipments of medical cannabis in any form and quantity, provided the requisite permits are obtained. The country’s medical cannabis industry has already attracted more than 407 million Canadian dollars ($306 million) in foreign direct investment into the fledgling sector, according to estimates by Denmark’s Horticultural Association and Invest in Denmark. Canadian medical cannabis giants Aphria, Aurora Cannabis, The Green Organic Dutchman and Canopy Growth have all planted their flags in Denmark. Smaller players also are getting involved. Canada’s ICC International Cannabis is teaming up with Israel’s Sababa Sciences to build a 473,000-square-foot, fully automated greenhouse. Through their respective local partnerships, Canadian medical marijuana corporations are establishing cumulative cultivation space of more than 2 million square feet to meet local and pan-European demand. “I think in the next year the market is going to explode. We are in the middle of everything,” said Rikke Jakobsen, CEO of Cannabis Danmark, a nongovernmental organization working with producers, patients, doctors and politicians. Easy access to the European Union market and proximity to Germany – the “golden goose” of the medical cannabis industry. “You can pick up the phone and call the medicine agency and talk with the CEO. They have been quick in this matter,” Jakobsen said. One of those producers is Ontario-based Canopy Growth, which formed a joint venture with hemp producer Danish Cannabis ApS called Spectrum Cannabis Denmark ApS. “Denmark moved quickly to establish a licensing regime and that proved to be attractive as we were looking for jurisdictions to diversify production capacity,” said Jordan Sinclair, Canopy’s vice president of communications. Denmark’s agricultural automation also makes up for a disadvantage the country faces in cost competitiveness from warmer countries, said Michael Prytz, investment manager for Invest in Denmark and senior adviser for Ministry of Foreign Affairs. “From a cultivation standpoint, the country’s agricultural sector has adapted over the years to rely less on less predictable and expensive manual labor in favor of highly automated agricultural ecosystems,” he said. Unlike Germany – which will contract with private companies to produce a small amount of medical cannabis – Denmark has no limit on how much medical marijuana can be produced. Denmark also has among the cheapest power in Europe, which is one of the biggest input costs in medical cannabis cultivation. 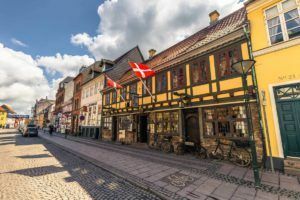 Denmark’s medical cannabis program is actually two parallel four-year trials – one for domestic medical use and another for domestic cultivation – and there is no guarantee that either program will be extended once concluded. However, Prytz said it is unlikely the programs will not be extended – and could potentially be made permanent. The four-year trials received backing from 94% of the country’s parliamentarians. Not all in the Danish MMJ garden is rosy, however. For example, many local doctors remain skeptical of the efficacy of medical cannabis. The country reacted by forming the Clinical Cannabis Forum, a group of prescribing physicians and scientists, to increase awareness in academic and medical circles. The group plans to make courses available for doctors this year. Jakobsen said doctors are looking for information around dosages, cannabinoids and product availability. From a broad industry perspective, international competition from places such as Portugal, Malta and Greece, all of which have longer growing seasons and cheaper labor, is one of the largest threats to the domestic industry. Prytz said agricultural competition from Southern Europe is nothing new for Denmark, and the country’s greenhouses have found ways to out-compete sunnier jurisdictions. About a quarter of Denmark’s total exports are related to the agricultural sector. “What happened is that competition came in from southern Europe, where the climate was clearly better, so nurseries in Denmark had to get more sophisticated and automated,” he said. Peter Homberg, a partner at Dentons law firm, said Germany’s approval process for medical cannabis cultivation is taking too long – and that has given companies in countries such as Denmark an advantage. The caveat, according to Homberg: The 1961 Single Convention on Narcotic Drugs remains a hurdle for Denmark – as is does for all countries yet to export medical cannabis. For a permit to be granted, a government agency from an importing country must conclude that an exporting country is either in compliance with the 1961 Single Convention or has the ability to legally navigate conditions of the treaty.